I’ve heard Eric Dolphy’s music described as being “too out to be in and too in to be out”. In a way, that’s perfect really. While he is largely recognized for his contributions to the jazz idiom. his visionary and unique approach to creating music defies categorization. There is a transcendent quality to so much of what he created. More than anything, I think of Dolphy as being an avant-gardist. In this respect, his music is right at home in sharing a concert with pieces composed by the likes of Kaija Saariaho. 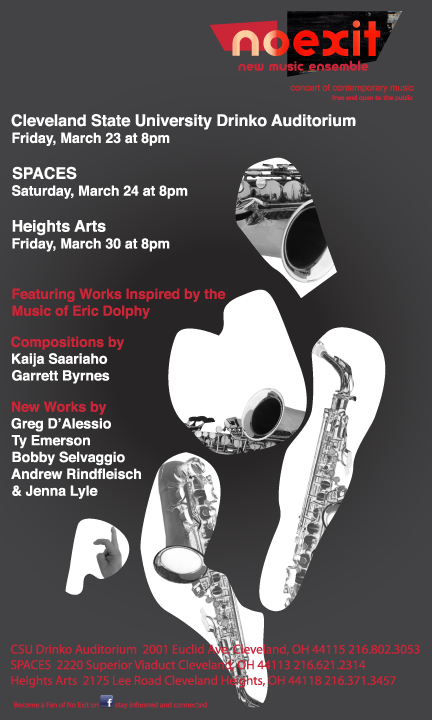 It should be said that this concert is not merely a tribute to the great Eric Dolphy, but also serves as a testament to his legacy and ongoing influence. With this in mind, Eo Exit asked three composers – Greg D’Alessio, Bobby Selvaggio and Andrew Rindfleisch – to give us their take on Dolphy. This program has also afforded No Exit the opportunity to collaborate with some of the most talented jazz musicians in Northeast Ohio. We are honored to include Chris Baker, Scott McKee and Bobby Selvaggio on tonight’s program.